This weekend our community is on stage with our annual all-school musical production featuring student performers from all our elementary schools as well as Mohawk students in grades 7-12. This year’s show Seussical the Musical is a delight for all ages, and there are still tickets left for this afternoon’s 2:00 pm performance! A big shout-out to all the students who are involved in this production: performing onstage, playing in the pit band, behind the scenes working the lights and sound, those who designed the digital backgrounds and prepared the whimsical sets, and everyone who is putting the show together. Many thanks to the staff who are involved with this production, and the crew of parents and community members who have been instrumental throughout the process. 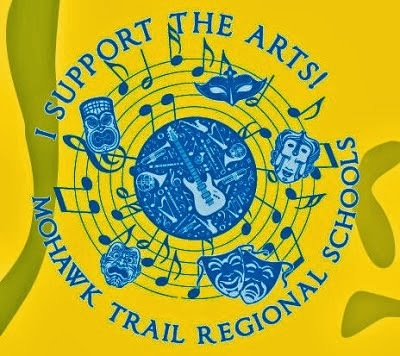 We appreciate all the support of the Mohawk Music Association. Only one more show to go! We've already reserved over 300 seats for Sunday but we still have room for more! The cast and crew of Seussical have done a fabulous job! All of their hard work paid off! There is still time to call for reservations! Call (413) 625-9811 x1364 Hope to see you at the show! Congratulations to all of the students involved in “Seussical” this weekend! Students have been delivering fantastic performances on stage and off! I’d like to say thank you to everyone who has come to see the show, and a special thank you to everyone who has helped with the performances! We have had a great crew of parents, alumni, and MMA members volunteering their time to help with everything from tickets and programs to hair and make-up. Thank you!! Below you can find a summary of what students are learning in high school music classes. You can also read about Tri-M’s upcoming activities and the Concert Band’s participation in the MICCA Festival. What’s Happening in the Music Room? Several members of Concert Band have been participating in “Seussical” performances this weekend, where they have been playing side by side with professionals! Next week, Concert Band will resume rehearsing music for the MICCA Festival in March, where the ensemble will be adjudicated and coached by distinguished music educators. In Concert Chorus, students are continuing their study of triads, and they have completed their first new piece of the semester, “Bring Me Little Water, Sylvie.” Concert Chorus has begun working on “May the Road Rise Up to Meet You,” a setting of a traditional Gaelic blessing. Select Chorus is moving forward with their study of “With Drooping Wings.” They are also working to refine their interpretation of “Run To You.” Students in strings class are building their left-hand and right-hand technique on cello and upright bass, and are progressing with their work on original arrangements of songs by Ozzy Osbourne and Nirvana. Jazz band students are wrapping up a unit on the Blues and are preparing for an improvisation quiz: they will each solo for three choruses over Duke Ellington’s “C-Jam Blues.” Music Theory students have created their first score using Musescore music notation software, and have begun transcribing familiar melodies by ear. Please feel free to visit High School Music class pages! Mohawk’s chapter of Tri-M, the National Music Honors Society, is planning some exciting activities for March and April. Students involved in Tri-M will be presenting an acting workshop for middle and high school students on Friday, March 13, from 2:30-4:00pm in the Mohawk Auditorium. Students interested in auditioning for Mohawk’s upcoming spring theater productions – Monologues and The Breakfast Club – are strongly encouraged to attend! Tri-M members will also be conducting outreach with elementary and middle school music students. More details to follow. Concert Band will be participating for the first time in the Massachusetts Instrumental and Choral Conductors Association (MICCA) Festival. The festival will take place at Belchertown High School on Saturday, March 28. We are performing at 3:00pm. Our performance will be adjudicated by a panel of distinguished music educators, and we will receive a 30 minute clinic with one of the judges. We will also be able to hear other schools’ performances, and we will stay for an awards ceremony. Following the festival, students in Concert Band will be able to hear a recording of the performance and read the adjudicators’ comments and suggestions for improvement. This is a very important formative assessment for Concert Band, and we look forward to the opportunity to receive critical feedback as we aspire to higher levels of performance. Tickets are now on sale for the March 27th Springfield Falcon’s hockey game! This year the Middle School band will be performing before the game, and the Middle School chorus will perform “God Bless America” on the ice as they have done in the past. Tickets are $18, and can be purchased by emailing me at gglover@mohawkschools.org, or you can see a middle school music student. **Please note - students and chaperones will also need to purchase a ticket. As you may know, this is also a fundraiser with $5 per ticket earned from each purchase. Our goal is to sell at least 100 tickets. The funds will be used to pay our buses for the Falcon’s game and for the bus for our Six Flags performance trip in May, which will decrease the amount per student for the day. We have had MANY families purchase tickets already. Please help us achieve our goal!! This past Saturday, March 7th, 8th grade music students Guy Rice-Lesure, Mae Rice-Lesure, and Lily Wickland-Shearer spent the day at Belchertown High School for their first rehearsal in the Junior District Festival Chorus’. This audition-based festival includes musicians from all over Western Massachusetts! Our Mohawk students spent the day singing with many talented students throughout the area. They will also spend next Saturday rehearsing at UMASS, and then perform in a concert including the female chorus, male chorus, jazz band, concert band, and string orchestra. I would like to send out a special thank you to the many middle school music students who performed in Seussical the Musical! It was inspiring for me to see the level of dedication these students have for the music program, and I look forward to continuing to work with you, and watching you perform in future shows! Thursday May 14th: Mohawk Music Department Spring Concert 6:30p.m. A senior at Mohawk, Laura Purington, is directing a stage adaption of the 80’s cultural icon, The Breakfast Club. Auditions will be in room 173 at 2:30 on March 10th and March 12th. No prior experience is needed, and students are not expected to have anything memorized before the audition. Auditions will last as long as it takes to get everyone through, but students can request to go towards the beginning in case of any time restraints.